This is an easy worthwhile hike. You will not be disappointed. You walk through a canyon with high walls at least 50 feet overhead. It is obvious how water has influenced this arid landscape. When it comes here, there is a lot of it, and it is usually moving very rapidly. Multiply that by several million years and you’ll easily see how this canyon was formed. This is an interpretive trail with many stops that the entire family can enjoy, provided you don’t bring them here in the summer when it’s dangerously hot. You can turn this hike into a loop, which sadly time did not allow for, but we did get to explore the cliffs and get a twilight view of Red Cathedral. What a beautiful spot! Trailhead: From the Furnace Creek Visitor Center drive South on Highway 190 for about 2 miles, and take the right turn onto the 178 South. The sign will say to Badwater. 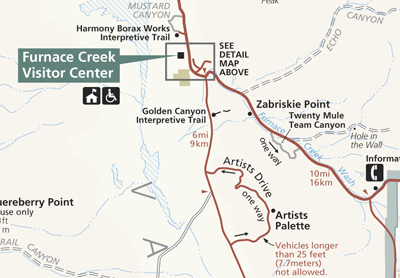 Drive for another 2 miles to the Golden Canyon parking area on your left – the east side of the road. Park, pick up a trail guide and set out on your way. At the kiosk you can check out the interesting explanation of the geology and natural history. Close by is the Artist’s Drive, make sure to take this one-way not to be missed course after your hike.